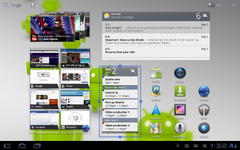 Honeycomb or Android 3.0 has not been able to do much justice to the high-profile tablets due to non-optimization of many apps from Froyo/Gingerbread. An updated seemed imminent, and this could be the right time when the 3.1 update arrives from Google. Acer and Asus have confirmed updates on their Android 3.0 tablet already. The tablets getting this updates as we know are the Asus Eee Pad Transformer and Acer Iconia A500. The UI and various visual interfaces have been made smoother and faster, with the new interface promises to be easier to see, understand, and use. There will be support for wider range of USB devices. The home screen widgets are now resizable, and there is an updated set of standard applications optimized for larger screens. There are some enhancements each for the gallery, calendar, contacts and email. Although Honeycomb is backward compatible, most of the apps right now are optimized for viewing and using on a much smaller screen. Till developers come up with more apps that are optimized for larger screen, Apple will hold this as one of their biggest strength (apps of iPhone can be run on iPad without any problem).